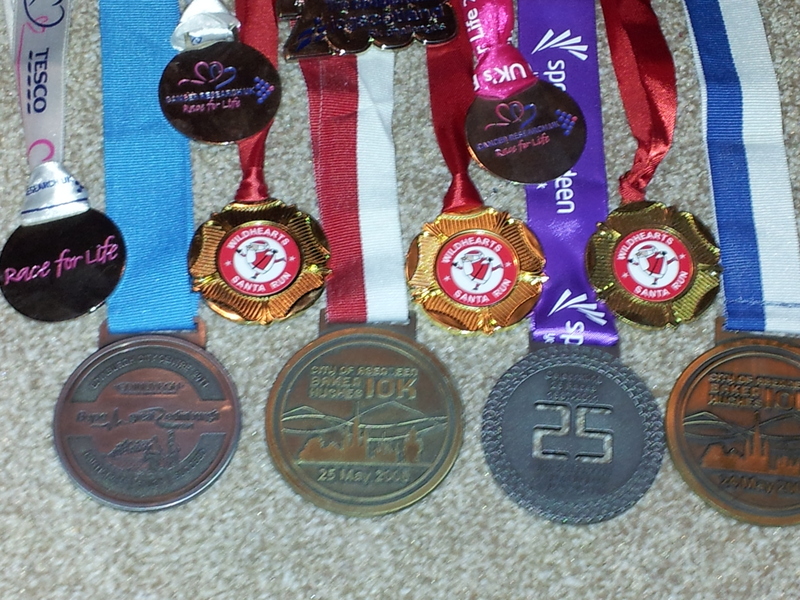 It has dawned on my that I don’t actually have a photo of my medals so far, and medals is what I’m all about. Shameful, I know, but something I intend to rectify ASAP. Even more shameful if the way my race mementos are ‘displayed’. For the past few years, they have accumulated slowly on a doorknob in my living room (they had to be moved from the bedroom doorknob because they were “too loud” whenever the door moved). They remain there, largely unnoticed by all who walk past them. Having scoured the internet, I have come up with a few very swanky solutions. This entry was posted in Goals, Medals, Running and tagged allied medal hangers, medal display, medals, running by MedalSlut. Bookmark the permalink. Love your medal holder idea…it made me chuckle, because I am all about the bling as well. Even though I am not a fast runner, people do go “wow” when they see my medals hanging on the door knob. Might just go out and buy a medal holder “RunningRagged” (assuming that is not too many letters lol). Good luck with your medal hogging quest of 2012! Nice collection, by the way! Thanks! It’ll hopefully double (roughly) this year. Otherwise, what am I spending my entry money on?! The floor lamp, I’ve got to be honest, doesn’t sounds like the best look. But again, I can’t talk, because my floor lamp would collapse under the weight of one and I use my doorknob. I’ll wait until my medals are being proudly displayed before I throw harsh judgement at others. It’s only fair.